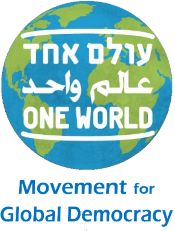 There are many ways to get involved with One World. You could attend one of our many lectures and talks, or join our monthly reading/discussion group, to learn more about global democracy and world federalism. You could join our mailing list and receive our interesting blog posts and news of upcoming events and campaigns. You could participate in one of our campaigns, or you could volunteer to help us in various ways, from writing on social media to brainstorming strategy to helping with fundraising. You could set up a new reading/discussion group in your area. And you could become a member and/or make a donation. Join the mailing list and receive updates about upcoming events and campaigns. We will not spam you with mail or share your details with anyone else.